The Edmonton Oilers sure have been prevalent on the blog these last few days, as there is lots going on up there in Central Alberta. More injury news dropped on Thursday afternoon, as the team expects to be without defenseman Justin Schultz for the next 2-to-4 weeks, as he is dealing with a back problem. Schultz was thought to have just a minor lower-body issue earlier in the week, but management came out with a press call on Thursday to make the significant injury announcement. It's hard to say whether or not Schultz has been dealing with the injury for long, but his numbers may make a reasonable argument that he may have been struggling the issue for a while, as he has only picked up 1 assist in the first nine games of the season. This is another significant blow to Stacey C.'s blueline, as he is already without Duncan Keith for the long-term, Stacey will be suffering through the better part of the first segment of the season from the back end. His team finished Thursday night in 19th place, 27 points out of the money already. These two injuries will certainly hold his team back, but with lots of hockey left to play, he could leave it to the rest of his team to get the job done. A lower-body injury was the reason why Buffalo Sabres forward Tyler Ennis was out of the lineup on Thursday night, as the Sabres took on the Penguins. There wasn't a great deal of detail about the injury, just that he was going to be out day-to-day for the time being. His status for tonight's game against the Flyers is still up in the air. This season, Ennis was taken by Scott, who finished Thursday night in 9th place in the standings, making some serious moves up the ranks. He currently leads the pool in weekly scoring for Week Four, finishing the night with 18 points. Well, the demotion to the minors didn't last too long for Flames goalie Karri Ramo, as the injury to Jonas Hiller is thought to be significant enough to warrant the recall of the Finnish netminder. Although there hasn't been an official announcement about Hiller's injury, it appears that Ramo's recall isn't an emergency recall, which means when Hiller is healthy again, there will be a trio of goalies that will all have to pass through waivers to make it down to the minors. Very interesting. With Joni Ortio still with the club, it would seem more likely that he would get the first call down the stretch and then they would call upon Ramo, if that goes to pot. Well, at least that's what Brenda & Seward should expect out of this situation, but it is a positive that Ramo is back with the Flames, since he can't get points in the AHL. It looks like Chicago forward Teuvo Teravainen was a healthy scratch on Thursday night, as the Blackhawks were in Winnipeg to take on the Jets. There were no reports of any injury concerns for the young Finn, so the next likely situation was that he was a scratch. Teravainen hasn't been very noticeable in the Blackhawks' lineup early on this year, so maybe a healthy scratch is something to kick him in the rear end. Eric's team holds onto Teravainen this season, but has yet to really see many positive returns from him. His team sits in 17th place in the overall standings and has now dropped into a tie for 1st place in the PIM pool as well, not that Teravainen has helped much in either. The Canadiens were a decent bet for being the team that helps Alex Semin bounce back from a couple bad seasons in Carolina, but with only 3 points in 10 games, Semin hasn't exactly been producing well enough to stay in the lineup. On Thursday night in Edmonton, Semin was finally made into a healthy scratch and unless he can get his game back together, he may find a few more nights in the press box. As a hockey pool player, Semin was a reasonable gamble, especially as an 11th round pick. Unfortunately for Dale C., it seems less and less likely that this gamble will pay off with any great dividends. If the speedy scoring winger can't make it in Montreal, I wonder if his days in the NHL are numbered. The Tampa Bay broadcast team were rather puzzled to see Jonathan Drouin's name on the scratches list, ahead of the game against the Colorado Avalanche, thinking it was just a healthy scratch keeping the sophomore forward out of the Bolts' lineup. It was later revealed that it was a lower-body injury that kept Drouin out and the outlook for this injury isn't great, as he is now doubtful for Saturday night's game against the Bruins, but the team couldn't offer too much more than that. Drouin has been okay for the Lightning and Allan (in the pool) this season, picking up 6 points in the first 10 games of the season. Allan's team finished the night in 20th place in the standings. On Wednesday night, only Ryan qualified for Week Five of the survivor pool, leaving six teams still in the dark, heading into Thursday night. On the plus side for those teams, it's a busy night on Thursday and they might just have some action to get their teams through to next week. As mentioned in this morning's notes, Thomas Greiss will be getting the start for the Islanders, where he'll be taking on Eddie Lack and the Carolina Hurricanes, setting up a big goalie survivor pool match-up between Eric and Jeremy. Winner moves on, while the loser stresses for a little while longer. Allan gets a pair of chances to stay in the competition on this busy Thursday night, as he'll have both Ben Bishop and Jeff Zatkoff going in separate games, as the Bolts take on the Avalanche and the Penguins play the second half of back-to-backs against the Sabres. Their opponents are either qualified or eliminated in the competition. In the first game of back-to-back nights for the Montreal Canadiens, the team has decided to give the pool's best player, Carey Price, the Edmonton Oilers as his start, likely leaving Mike Condon for the start against Calgary on Friday night. The Habs will also play again on Sunday, so if John S. fails to get the win tonight from Price, he will have one more shot with him, if needed. The Edmonton Oilers have recalled centre Leon Draisaitl, ahead of Thursday night's clash against the Montreal Canadiens, placing Jordan Eberle on the Long Term Injured Reserve to help accommodate the move. Draisaitl was thought to be close to making the Oilers out of training camp this year, but depth became an issue for the German and he was sent down to the AHL to get some certain playing time. He will likely be dressing for the game against Montreal tonight, making his 2016 season debut. Draisaitl was one of the last picks in the draft this year, as Eric took him 374th overall. If Draisaitl was to have a goal and an assist in tonight's game, he would be cost efficient, as that's what the 374th ranked player in pool scoring has thus far in the season. Believed to be one of those European diamonds in the rough rookies this season, Sergei Plotnikov still hasn't quite found his stride yet with the Pittsburgh Penguins, but to be fair, neither has the whole Penguins team. The 25-year old Russian was going to be a mature rookie scorer, lined up alongside one of the big centres in the top six and score like the dickens. Well, that hasn't quite happened yet and on Wednesday night, he was a healthy scratch for the game against the Washington Capitals. Nevertheless, it's still early on in the season and fortunes can change just as quickly. John R. took the Russian winger with the third-to-last pick in the draft, hoping to hit a home run with this rookie pick. In seven games played, he has only managed to collect 1 assist, but like I said earlier, it's still early. Sidney Crosby only has 3 points, if that makes you feel any better. In the Flames/Senators game last night, Calgary starter Jonas Hiller was knocked out of the game in the 3rd period, after a collision with Ottawa forward Bobby Ryan. Hiller had to leave the game with a lower-body injury. After the game, it was mentioned that Hiller would be re-evaluated on Thursday and that's where it was left. Joni Ortio came into the game and finished it off, as it went into the shootout and Calgary lost the game 5-4 in the skills competition. This result kept Grant from possibly earning his win to stay in the goalie survivor pool on Wednesday night and if the injury is serious, it could put serious strain on his team staying in during Week Four. Grant's team is also struggling to score goals, which has them down in 18th after Wednesday night, 25 points out of 1st place. Early notes from Thursday morning practice in Brooklyn, as Jarolslav Halak will get the night off, due to feeling under the weather today. Halak did not practice this morning, which will leave Thomas Greiss to start the game and J-F Berube will be the back-up against the Hurricanes. Of course, this should be a day-to-day issue and we'll probably see Halak back in the starters net before too long. Fortunately for Dale B., his team has already qualified for Week Five in the goalie survivor pool, so he can breathe easier about that, but now trailing 1st place by 1 point after Wednesday night, he could have really used those easy 2 points from a win against Carolina tonight. He'll have to source those points out somewhere else on his roster. So, it was a day off for the goalie announcements on Tuesday and that was a busy one. A good day to take off, no? Anyways, already qualified for Week Five includes Stuart, Dale B., Derek W., Scott, John P. and Stacey M., having their wins come early in the week is much less stress on their well-being. Six teams through, seven teams left to follow suit. On Wednesday night, we have three games on the NHL schedule, so let's see if we have any more opportunities for teams to make it through. In game one of the night, the Calgary Flames are in Ottawa to take on the Senators and Grant will get a shot to move on, as Jonas Hiller gets the nod for the visitors, taking on Craig Anderson (John P.). Pittsburgh and Washington go head-to-head in D.C. tonight and it is expected that we'll see the top two goalies go, as it will be Marc-Andre Fleury (John R.) taking on Braden Holtby (Jeremy). Jeremy is on the list of teams still trying to qualify for next week and his goalie gets a home game to try and accommodate. Finally, in the last game of the night, it looks like it is a battle of two goalies trying to qualify, as Ryan's Pekka Rinne and Scott's Martin Jones will go in the game between the Predators and Sharks. This one has the makings of being a pretty good game, besides the goaltender battle. All six goalies are pool-related, so that will keep all the minutes in the competition, so that's good news! The Calgary Flames welcomed a familiar face back to practice on Wednesday, as defenseman T.J. Brodie is making his way back to playing shape, coming back from a broken hand. Brodie suffered the injury in the preseason and has yet to dress in the regular season and tonight, as the Flames are in Ottawa to take on the Senators, he'll be a game-time decision for this one. If you needed any more indication that it is likely that he plays, he has been activated from the IR. If he can't go, he'll be listed as day-to-day, so that is good news for Mike, who has been patiently waiting for his injured bodies to get healthy again. In more positive news, the Tampa Bay Lightning announced that they have sent back-up goalie Andrei Vasilievskiy down to the AHL on a conditioning stint, as he works his way back from a blood clot in his leg. He will get some playing time down in the minors for about a week and then it is expected that he'll rejoin the team and then push Ben Bishop for the number one job with the big club. More good news for Mike, as his team slowly begins to get healthy. As of today, he's 38 points back of 1st place, which is a big total to overcome, but if his team is healthy, it's still got more than 20 weeks to make that back. The Anaheim Ducks are expected to be without forward Ryan Getzlaf for at least a few days, upwards of a couple weeks, as the 30-year old captain is undergoing an appendectomy on Wednesday. The initial prognosis is between 4-to-12 days on the shelf and for how poorly the Ducks have been playing to start the season, the former is much better than the latter. To start the season, Getzlaf has not been his usual offensive self, picking up only 1 assist in the first eight games of the season. This is not the production you'd expect from a 2nd round pick, just ask Allan. Allan's 22nd place team is in dire need of the regular Getzlaf back, just so he can come back and compete again. The Arizona Coyotes are off to a much-hotter start than anyone expected, but they are starting to run through a period of injuries and included in that mess is forward Martin Hanzal, who was forced to miss Tuesday night's game against the Boston Bruins with a lower-body injury. He's currently listed as out day-to-day and his status for Friday's game, home to Vancouver, is likely still in the air. Hanzal was off to a damn fine start this season, picking up 10 assists in his first nine game this year, so there is no question that his assistance was missed in the 6-0 loss to the Bruins last night. Stuart was also missing that production, as his 11th round pick was out of the lineup. The growing pains of being a rookie defenseman in NHL... Noah Hanifin was a healthy scratch for the Carolina Hurricanes on Tuesday night, unable to dress against the Detroit Red Wings. In eight games this season, Hanifin has 2 assists and 4 PIM, which doesn't appear to be all that bad, considering how questionable the Hurricanes were looking on paper to start the season.. Still, it wasn't enough to keep pushing in the lineup, but I don't imagine that he'll be in the press box for too much longer. Hanifin was Derek & Dan's entry into the rookie race this year and a couple points is certainly better than nothing. He was one of the last picks in the draft, so the expectations had to be a bit measured, but you'll notice a few bargain picks in the post, so it isn't unfair to hope that he would have been one too. The Edmonton blueline is currently having some injury struggles of their own already in the early part of the season, as defenseman Justin Schultz missed out on Tuesday night's game in Minnesota, due to an undisclosed injury. He's day-to-day for the time being and we'll wait for an update on his status soon. Stacey C. has only collected 1 assist in his first nine games of the year, which isn't great production from his 9th round pick, obviously. Stacey's team sits down near the bottom of the standings, down in 25th and ranks at the bottom with projected games to be played this week, so it doesn't appear to be getting much better right away. A lower-body injury, possibly a muscle strain of some kind, appears to have gotten the best of Jaromir Jagr on Tuesday night, as he left the game between the Panthers and Avalanche in the 1st period with the ailment. Jagr was unable to return to the game and he will likely be re-evaluated Wednesday and hopefully, there will be an update on what we should expect for a timetable. Even at 43 years old, Jagr has still been great. In nine games played, Jagr has 10 points, ranking him 18th overall in pool scoring after Tuesday night, which would be good enough for a 1st round pick. This makes him into one of the biggest bargain picks of the draft, so far, as John P. picked him in the 8th round, 197th overall. Finally, the Vancouver Canucks were able to snap the Montreal Canadiens' winning streak and they did so without defenseman Dan Hamhuis in their lineup, as he was given the day off as a maintenance day. It's somewhere between an injury and a healthy scratch, likely just to rest the bumps and bruises he's already accumulated in the early part of the season. He's day-to-day and I would imagine that he should be ready to go for the team's next game, Thursday night in Dallas, unless there is some kind of revelation about his injury status. It has been a disappointing start to John R.'s first season in the pool, as his team is failing to meet expectations early on. His team is just a little out of sync, throughout the NHL, but they could turn it around, if the injury news got a little bit better and the team was to start scoring, like they were expected to on paper at the start of the year. As play was started for Week Four on Monday night, the Edmonton Oilers announced that they placed non-pool defenseman Griffin Reinhart on the IR with an undisclosed injury and in his place, they have recalled rookie defenseman Darnell Nurse. Nurse wasn't quite able to make it out of training camp with the big club, but after a few weeks and six AHL games, the 20-year old rearguard gets his chance to possibly crack the lineup for his first NHL regular season game. This recall means that his projected games gets added to John S.'s totals this week and John has a chance at possibly entering the rookie scoring race. Since there was no word on how long Reinhart would be out of the Oilers lineup, there's not much in the way of telling how long Nurse is expected to be up. It hasn't been a great Monday for player notes, a number of longer-term injuries reported on and this one just gets added to the pile, heading into Week Four. The Florida Panthers learned that they will be without Alexander Barkov for the next 3-to-4 weeks with a broken bone in his hand. If you remember, Barkov was hurt on Thursday night and was seen leaving that game with his wrist wrapped up and as much as there was some speculation, the rumours were proven to be true on Monday, as the broken bone prognosis was announced. The young Finnish forward was off to a good start this year, picking up 3 goals and 3 assists in seven games to start and he goes into Week Four ranked 88th overall in pool scoring, a ranking that is destined to fall over the next month. Ryan was definitely enjoying that early success out of Barkov, but that bit of production now comes out of his lineup for now and he'll have to count on St. Louis rookie Robby Fabbri, who is coming back from a concussion this week, to pick up the slack. Ryan opens the week in 5th place in the standings, now 15 points out of 1st place. A new week brings new hopes to dash in the goalie survivor pool. Two teams were eliminated last week, leaving us with 13 teams left to claim the crown. On Monday night, we have three games on the schedule and below is what we expect in the survivor pool. In two of the three games, Dale B. gets two cracks at moving on tonight, as he has both Jaroslav Halak for the Islanders and Mike Smith for the Coyotes going tonight. Halak is taking on Joni Ortio and the Calgary Flames, which has implications on Ryan making it through to next week. Smith lines up against James Reimer and the Toronto Maple Leafs, which will give John S. an early shot at moving on to Week Five as well. In the later game, Stuart gets a start out of Corey Crawford, as the Blackhawks are hosting the Anaheim Ducks, who will have Frederik Andersen in net, looking for his first win for Benson, who has already been eliminated from this competition. That's it. That's all there is tonight. Short and sweet... not like tomorrow, where it will likely be chaos. On Saturday night, Evander Kane was the unlucky recipient of an unintentional knee-on-knee collision against the boards, close to the end of the game between the Sabres and Devils. Kane had to be helped off the ice and was looked at over the remainder of the weekend. On Monday morning, the team announced that the 24-year old scoring winger will now miss the next 4-to-6 weeks with a MCL injury and was fortunate to avoid having to undergo any surgery for the injury. In eight games this season, Kane hasn't exactly set the scoreboard on fire, picking up 1 goal and 2 assists, adding 2 PIM for good measure as well. In terms of pool scoring, starting Week Four, he ranks 263rd and is sure to drop with the amount of time he is expected to miss. This could very well be considered one of the worst-case scenarios for Derek & Dan in the pool, as they expected a little bit more out of a healthy Kane, as the Buffalo Sabres looked to retool their offense and improve upon a pretty poor 2015 season. That hasn't quite happened yet and Kane's lack of scoring could be one of the leading reasons why the pool's third duo is 18th in the standings, now 27 points out of 1st place. This injury could very well take Kane through the Week Nine Waiver Draft, which would make him a Week Ten activation, without being dropped and/or picked up. It will be something for Derek & Dan to consider when the draft drops. Kicking off the week without a tie is a great way to get going. Evgeny Kuznetsov established himself as a proper offensive threat in Week Three, finishing the week with 9 points, clearly taking the honours for Player of the Week. He certainly had the hype, as he joined the NHL, but it took him a little over a season to finally get acclimatized to the league and now his talents are pushing through. Kuznetsov played in three games in the week, registering a 3-assist game against Calgary on Tuesday, another assist against Vancouver on Thursday and then a monster game against the Oilers on Friday, potting a hat-trick and another 2 assists. It was certainly a coming out party on Friday for the kid. Those kind of numbers are going to work wonders for your season totals, especially this early in the season. Kuznetsov's 9-point week brought his total up to 11 points, which has him ranked 13th overall in pool scoring, the midway point of the 1st round, if we were to re-draft today. This would make him into an extreme bargain for Brian, who picked him in the 7th round, 180th overall. Sure enough, once you get a huge bargain pick like Kuznetsov and you were fortunate enough to surround it with some pretty good talent in the same week, you're going to get the Mover & Shaker nod in the week as well, so Brian walks away with two headline spots in Week Three. The Mover & Shaker from down under finished the week with 33 points, which shimmied him up the standings, where he started the week in 18th place and finished the week in 4th place. Sure, we're still operating in some pretty close quarters in the early part of the season, but to move 14 spots in the standings is still pretty impressive. 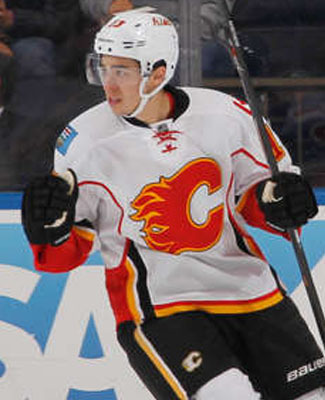 After the Player of the Week nod on his team, Johnny Gaudreau of the Flames finished the week with 5 points, followed by Jamie Benn of the Stars, who had 4 points. His top three players finished with 18 points between them, which was either tied or better than 10 teams below him in the pool in the week. That's pretty scary. Brian's team only had two naughts during the week, which meant that he was seeing some very spread out scoring in the week. His team also ranks 10th place in skater games played, staying relatively healthy, while his goaltending may leave a little to be desired, ranking 18th in minutes played, but he does have one starter, so that should keep him afloat. This is Brian's 4th Mover & Shaker nod in just a little over one season's worth of playing in the pool, so he's catching on and becoming quite the force. On paper, when you looked at John R.'s team to start the year, you may have only questioned his second goalie decision, but otherwise, it was looking like a pretty decent team. Unfortunately, with some of the scoring woes of some of the top teams, his side hasn't quite panned out early on, like you would have assumed it would and that all rounded itself out in Week Three, where he couldn't find points to save his life. The week only garnered 11 points, which dropped his team down to last place (27th), but there is still some upside to his team, they just need to get their act together. In the week, Marc-Andre Fleury picked up 4 points to lead the way for his side, but eight players were all scoreless, including his pair in Carolina, Eric Staal and Jeff Skinner. Injury troubles on his blueline are going to be another contributing factor to keeping him down a little bit lower than some teams, but once a few of his superstars, like Jonathan Toews and Patrick Marleau finally get going, things should start working out for him. Okay, I thought by now, I would have had the prizes worked out, but I haven't been able to locate any more fun prizes over the last couple weeks, so it might just be a cash season. That decision will hopefully come down this week. After back-to-back weeks in 2nd place, Neil has finished a week in 1st place and he opened up a little bit of a lead on top of that as well, looking down from a 5-point cushion. Last week's leader, Dale B., didn't fall too far from the top, dropping down to 2nd place, while John S. remained as the 3rd place holder. In review, the top three teams didn't change, just a flip-flop of 1st and 2nd. That's not nearly as dramatic as one would have hoped. I promise... I'll have a breakdown of the prizes this week. One prize we know of already is the rookie pool and Ryan's team, the post-draft favourite, continues to mosey along with a couple of the best rookies on his side this season. Connor McDavid had a 4-point week to help lead his team in the week and he picked up another point from Artemi Panarin, bringing his season total up to 18 points. Ryan's situation gets a little bit better, as the Flames goaltending now has his fourth rookie on his team, now to see if he's getting any points. Just behind Ryan, something we'll monitor as well, Troy has 9 points in 2nd and Scott has 6 points in 3rd, as they'll try to keep pace as best they can. If they can stay in arm's length, they might be able to work something out in the Waiver Draft to help their causes out. Kristy & Don and Clayton were both eliminated from the goalie survivor pool in Week Three, as neither team could rustle up a win from their two goalies. Kristy & Don couldn't find a win from either Semyon Varlamov or Roberto Luongo, while Clayton only had Ryan Miller and he went winless in only two starts. John S. and Derek W. have to be the early favourites in the competition, as they lead the pool in wins through three weeks, with 8 and 7, respectively. The schedule in Week Four is quite busy, 48 NHL games, so it is good for teams to keep moving through to the next week. Meanwhile, in the PIM pool, Eric's goon team still leads the way in the race, despite only picking up 8 minutes in penalties through his team. His 68 PIM are still 6 minutes better than the preseason favourite, Wes, who is still well in the race. The goons of the week belonged to Brenda & Seward, who racked up 23 PIM in Week Three, moving up the ranks, as they now total 45 PIM. Still a line brawl away from 1st place in the pool, but they're still within a rabbit punch from the top... or a few. It was a down week in games played in the NHL schedule, as there were only 41 games on the docket, but scoring throughout the pool was the best of the three weeks so far, just barely eclipsing the average points per NHL game of Week One. Injuries and suspensions reduced the average number of skater games played per NHL game in the pool, which took down the average number of PIM per game, but that's to be expected. We saw a few more injuries in the week and there are not very many players scheduled to be back this week, so it could be a wash in the improvements from our pool in Week Four. Hopefully the scoring stays up, since that's what we're all here to see. It's almost hard to believe that the Columbus Blue Jackets registered their first win without forward Ryan Johansen, but that was exactly the case. Johansen was sent home back to Columbus from the team's road trip, due to an illness and he was unavailable for the game. As of Monday morning, there still wasn't a great deal of detail on the illness that Johansen is suffering from, but his agent suggested that it isn't thought to be too serious, but it is fatiguing his client and hasn't had enough energy to play. For now, he'll be considered day-to-day with the illness, which is about the best news that Eric could expect for one of his top forwards. Eric's team finished the week in 15th place, 24 points back of 1st place and in order to close that gap, he'll need a healthy Johansen. The Islanders coaching staff were busy on Saturday night, trying to make examples of some of the big guns of the team. Forward Ryan Strome and veteran defenseman Marek Zidlicky were both healthy scratches for their game against the St. Louis Blues. Even with the Islanders pulling out a win, the team is still expected to have both players back in their lineup on Monday night, when they play host to the Calgary Flames. This was a short-term stint in the press box for both. At the end of the day/week, it was a lost skater game for each Clayton and Benson, respectively, nothing that either team needed, as they try to keep pace with the top three teams in the pool. Scary moment for the Philadelphia Flyers over the weekend, as forward Michael Raffl ran into Rangers forward Jarret Stoll, getting caught right on the button with an unintentional elbow. Raffl's scarier moment came ont he bench, when he seemingly lost consciousness and thus ended his night. Reports on Monday suggest that Raffl has passed all of the concussion testing and he isn't expected to miss any time. This is good news for our reigning Mover & Shaker, who is making his ascent up to the money spots. Brian took Raffl in the 11th round this year and only has 1 assist through seven games. One more Islanders note before we close down the Newsletter for the week... the team has placed defenseman Thomas Hickey on the Injured Reserve, due to a lower-body injury, but have said that they will release a timetable for his return later on in the week. I'm sure with the update, there will be a few more details and if it is longer than the week's obligation on the shelf, we'll have a post for it. Nevertheless, we'll have to strike the projected games to be played from Cindy's Week Four total, which will be reflected with the weekly reset. I don't think it would be fair to speculate any further than that, but I can say it will be increasingly difficult to start making up that 30-point gap to 1st place without another skater.